My strategy for evaluating an investment property depends largely on the type of property desired. If you’re talking about residential real estate investments, obviously the distance from major urban areas, stability and trajectory of the local population (up or down), and the availability of essential infrastructure—transportation, services, schools, shopping, restaurants, recreational facilities and so on—are all crucial. Japanese people living in major metro areas, for example, prefer to live within ten minutes’ walk from the station. Younger people also prefer to live very close to the office, which is why the central area of Tokyo is much more crowded than it was ten years ago. This is especially true when young couples are both working. Having a child when both parents are working is even tougher, especially in terms of time management. These families prefer to live close to the office and to childcare, kindergartens and nursery schools. Train lines, by the way, also have a degree of brand image. In the Tokyo area, the Tokyu Denentoshi Line is supposed to be the best private train line, which is why properties near its stations are very expensive. Their zoning of development is very good from an architectural point of view. The Tokyu Toyoko Line would be next, then maybe the Odakyu. Other private lines like the Keikyu Line are viewed less favorably. JR Yamanote Line stations are mostly prestigious, although not as much in the eastern part of the city. The Yamanote Line is a loop line, and property “inside the loop” is always pricy. If you want a higher rate of return, you have to go to the less popular places. The best area for a commercial property in Tokyo, by the way, is still Ginza. We have rankings in terms of brand image for commercial properties, and the government announces the average land prices in the major areas all over Japan every year, and Ginza has been on the top for more than hundred years. In the last three to four years, the cost of property in the Ginza area went up sharply again, and in fact has surpassed the price during the dot.com bubble era. So if you know good, prestigious properties and land, you still have a lot of opportunity to make money. But if you go to the wrong area, you’ll definitely lose money, because Japan as a whole is going down. Other areas within the city that have gone up sharply in the last three or four years include central Tokyo districts like Roppongi, Shibuya and Akasaka, partly because of domestic investors but also because of foreign institutional investors like Blackstone, which created the first Asia-focused fund a few years ago. The fund’s first investment was in Tokyo. Shinagawa is another. The area has been attracting attention because the government announced the development of the Shinagawa area on land that was some sort of warehouse for Japan Railways. They need a station nearby because they want to develop shopping centers and offices. You don’t want to walk far, even if it’s a newly developed area. People are willing to pay a premium for a one-minute walk over one that takes ten minutes. So you need to look very closely at those government plans or provisional government plans, because government plans are always officially announced. The bottom line is that you want to be very sure that somebody else will want to buy or rent the property, and that the local conditions will be persuasive. Rumors spread even before that. One unusual thing about the real estate business in Japan is that we don’t have any rules against insider trading. You can use as much insider information as you like, which is one reason people would contact me. People in the business interact on a daily basis, and big developers tend to talk. Even after the announcement, you can still make money if you’re quick. Investors have maybe six months between the time the announcement is made and when development begins. Buying real estate in any country involves risk and unknowns. 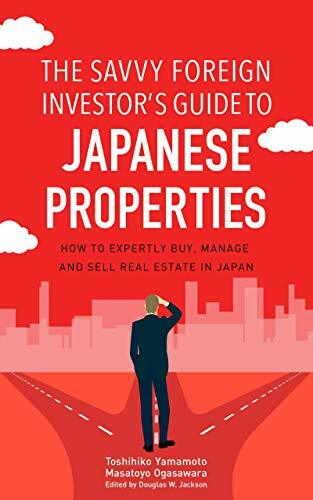 This book tells foreign investors how to buy high-yield properties in Japan with confidence.